The image below is of a skull from a Bell Beaker burial in Bee Low, Derbyshire, England, dated to 2200–2030 calBC. Its "extremely low" oxygen isotope value of 16.2‰ matches that of the Amesbury Archer, and suggests that it may have belonged to a migrant from a place with a cold and "continental" climate, possibly outside of Britain. 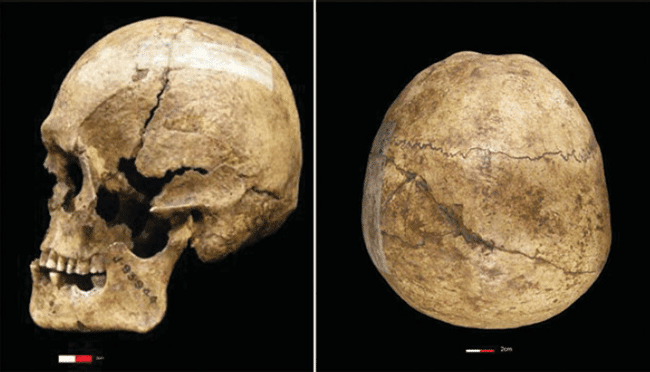 You can read more about this skull and its unusually flat occiput in a new paper about British Beakers by Pearson et al. at Antiquity here. If you don't have academic access to journals, try the link here. Bell Beaker Blogger also has a useful summary of the paper here. Abstract: The appearance of the distinctive ‘Beaker package’ marks an important horizon in British prehistory, but was it associated with immigrants to Britain or with indigenous converts? Analysis of the skeletal remains of 264 individuals from the British Chalcolithic–Early Bronze Age is revealing new information about the diet, migration and mobility of those buried with Beaker pottery and related material. Results indicate a considerable degree of mobility between childhood and death, but mostly within Britain rather than from Europe. Both migration and emulation appear to have had an important role in the adoption and spread of the Beaker package. I like the example of the single immigrant bull in the herd of cows to explain how the entire genetic landscape could change from the repeated introduction of high status male immigrants from elsewhere. The Y haplogroup data is definitely in line with this, but what about the mtDNA? It seems that the Bell Beaker women were just as mobile, they just couldn't have as many children as the men. It also says alot that the men seem to be coming and going from all over the continent, yet they must have been mostly from closely related male lineages. Of course that is speculation based on modern Y haplogroups in Britian, but I doubt that the genetic data from these people will change that. I hope it won't be too long for DNA analysis. There's at least one major ancient DNA paper on the origins of the Bell Beakers coming soon, and I'd be surprised if it didn't include samples from Britain. In fact, I'll put my money on "flat occiput" guy being one of them. The one that was recently reported on in the Spanish press. It includes new Beaker samples from Spain, Portugal, France, and probably Britain. Just hope its not an Unicorn. I wonder if something is really about to come out. Max plank, I think. But they are so quite. What I know is that several Universities in Iberia are part of a large british study to go deeper into MTdna of ancient samples... but its something to be concluded in something like 3 year... so not for the near future. Nah, the Beaker paper I'm talking about should be out this year, and it'll definitely have genome-wide and Y-DNA data. Basically, in terms of the data and analysis, expect something like the Haak and Mathieson et al. papers, except focusing on Bell Beaker origins. Dave, i don't recall hearing your hypothesis on BB ? I don't really have one yet. I need to see the new ancient DNA data from Iberia first. his middle face is also flattened. Has the DNA of this individual been analysed? As a diagnostic feature of the inhabitants of the British Isles, both ancient and modern, a doliocephalic head with a prominent occiput is standard. Thus a strongly brachycephalic head immediately raises alarm signals. Modern Brits aren't dolichocephalic. They're most certainly mesocephalic. And from what I've seen, brachycephalic Brits aren't uncommon, especially in the industrial north of England, where people probably have more steppe ancestry than the other English. Also, like I said, the Bell Beaker skull in the image above will probably get a DNA test sooner rather than later. One year from now we expect to publish the first results, the data of present population of Iberia, or the ancient bones, whichever comes first… The study will have two components: global characterization of Iberia with unprecedented precision and genetic analysis of ancient bones, 4800 to 5000 years old, found in various places in Western Europe. Many will be from Alentejo, Portugal. For the assessment of the present Iberian genetic portrait, the team intends to collect thousands of samples from regions of Portugal and Spain, explains Pedro Soares. The goal is to sequence all the mtDNA… The study of human remains will be equally centered on mtDNA, to allow comparisons. If I were to approximate, it seems that there was a decline in the Neolithic population, from 4000 BC in the Balkans, 3500 BC in central Europe, and 3000 BC in Britain. New forms of economy based less on classical LBK type cereal farmers, and back toward hunting & foraging techniques as well as new forms of pastoralism. In middle Neolithic central-west Europe, it is already clear that there is a lineage shift more toward non-haplogroup-G groups (such as I2 and even some type of R) already by the Late Neolithic. So BB Europe globally would have been mostly various I groups and R1b. I hope there is a lot more genome-wide SNP coverage than is indicated in these summaries. Perhaps the projects were written and proposed before ancient genotyping on hundreds of samlles seemed reasonable. The lactose tolerance allele story should be especially interesting with the bell beaker folk. Basically, as far as I know, one project is going for 1.2 million genome-wide markers for each sample, plus Y-HG and mtDNA haplogroups, and the other will be focusing on full mtDNA sequences. Not really sure what mtDNA, even at the highest resolution, can really say about the origins of Bell Beakers, but maybe the project was designed when that was the optimal solution? As for the lactose tolerance allele. I see that the earliest example was in a Bell Beaker. And then it was found in the R1a-Z93 Srubna/Timber Grave people. So... it seems that once the Indo-Europeans moved out from their original homeland in India, they passed on their lactose tolerance allele along with their R1a haplogroup to the Srubna people, who then gave it to their distant cousins, the R1b Bell Beaker people of Europe. The dates are a little fuzzy... but that is probably some kind of reservoir effect from all the milk consumption (or from the chickens). Genetically, i wonder what Bell Beakers would look like from the Benelux region compared to modern populations etc. Stop. You're making me laugh so hard it hurts. "It also says alot that the men seem to be coming and going from all over the continent, yet they must have been mostly from closely related male lineages." Caesar wrote that the Gauls believed their religion came from a holy island to the west so I wonder if Wessex (SSW England) may have been a religious center. Some Roman writer (I forget which) also mentions the Druids running youth camps which if true might be related. "Results indicate a considerable degree of mobility between childhood and death, but mostly within Britain rather than from Europe. Both migration and emulation appear to have had an important role in the adoption and spread of the Beaker package." Connected to a switch from neolithic package to dairy? If the neolithic package had never been as effective in Britain/Ireland due to heavy rainfall or if there had been some climate effect making it less effective than it had been previously then there may have been spare land for dairy farmers - so maybe after the first few arrive (for whatever reason) word goes back there's land for dairying.? "word goes back there's land for dairying"
Or alternatively the first dairy farming settlers spread out to fill the available space hence the homogeneity of the ydna - younger sons starting new settlements. "Today, maximum hg I diversity is in NW Europe, whilst R1b in southern Europe. So R1b was definitely intrusive into northwest Europe & Britain, probably with BB." hg I diversity may or may not peak in NW Europe but it was once the main paternal lineage of all of Western Europe, this is proven by Ancient DNA. Treating it as a NW European lineage based on modern Y DNA makes no sense. It was once at a 70%+ frequency and very high diversity in Spain and Italy. R1b being most popular in Southern Europe means nothing about R1b origins. Southern Europe isn't a uniform region at all. Iberia, Italy, and Balkans are very separated from each other geographically. Treating Southern Europe as a single region for Y DNA is usually going to be a waste of time. Using modern Y DNA haplogroup frequencies to determine where a lineage originated is a waste of time anyways. You know full well all the evidence points towards R1b-L151 originating somewhere around Ukraine and then migrating from East-West and North-South in Western Europe. We literally have documented prove R1b-L21 arrived in the British isles from somewhere around Germany or France, not Spain. British, Irish, French, and Iberians are probably essentially Bell Beaker folk. It's got to be the last important movement of people in Western Europe. It meshed up (EEF/WHG/Steppe) and native (EEF/WHG) hyprids with each other in various degrees with R1b-P312 being the dominate paternal lineage. Then 2,000 years later the first writings about humans in Western Europe and most of them speak Celtic languages, so we have to consider Bell Beaker was mostly Celtic speaking. Indeed. There is no need to point out the bleeding obvious to others who have kept more or less apace with all recent developments. I'm not treating hg I as a NW European lineage, but I was stating that *today8 it survives there better & in more diverse forms. Given that NW Europe was under ice for several thousand years in the Palaeolithic, it is self evident that hg I did not arise there. But the point is, its greater survival in northern Europe suggests a more significant degree of Mesolithic lineages in the north. So I think we can agree there. * "R1b being most popular in Southern Europe means nothing about R1b origins. Southern Europe isn't a uniform region at all. Iberia, Italy, and Balkans are very separated from each other geographically. " The word you are looking for is prevalent, or frequent. If you are going to debate anthropological specifics, then you should learn to use big boy words which make sense in the context used. But, again, you have misunderstood a simple statement, I'm not saying R1b is “more popular” in southern Europe. In fact, it most obviously is not, perhaps you were not aware of this data, present for almost 25 years. Rather, I was stating that R1b's history there is more complex in southern Europe than the Atlantic fringe. In the latter, R1b is clearly a recent founder effect, being almost 100% dominated by P312-derived lineages (after removing U106 founders from later Germanics). You are probably not be aware, but the Italy & Balkans possess some rare & unusual lineages which are parallel to P312, and L23, such as PF7562, in addition to the more divergent still V88. What do you make of that ? • "Treating Southern Europe as a single region for Y DNA is usually going to be a waste of time. " Also a redundant statement, as no one is claiming all southern Europe is one homogenous mass with a singular history. But southern Europe is a useful geographic designator, last I checked. It certainly makes sense to most of us, although I did hear a few years ago that a lot of US-Americans don’t have maps, rendering common sense geographic designators somewhat confusing for them, and in this case, you. • "Using modern Y DNA haplogroup frequencies to determine where a lineage originated is a waste of time anyways. " I think everyone knows that. But I was not referring to frequency, but haplogroup diversity. Different concepts, as per above. * "You know full well all the evidence points towards R1b-L151 originating somewhere around Ukraine and then migrating from East-West and North-South in Western Europe. We literally have documented prove R1b-L21 arrived in the British isles from somewhere around Germany or France, not Spain"
I never said it didn’t. What is certain is that P312 expanded relatively “suddenly” from the late Copper Age. Of course, the actual pace can only be determined with more aDNA. 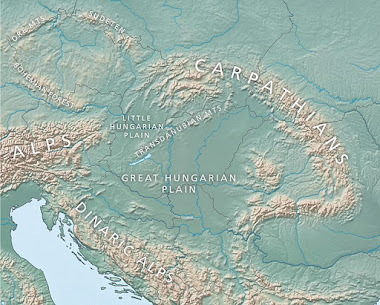 As would its ultimate location, but i have no disagreement that with the prevailing consensus that it was probably somewhere in east-central Europe; as stated “in addition to the east -central European LN- EBA shift” and the references to arrival of new forms of pastoralism. You treated Southern Europe as a uniform region. You stated R1b being most frequent in Southern Europe is why you think it originated there. I corrected actually mistakes you made. Don't deny statements you made and then say I'm not reading your comments correctly. "Then 2,000 years later the first writings about humans in Western Europe and most of them speak Celtic languages, so we have to consider Bell Beaker was mostly Celtic speaking." Unlikely. Known ancient Celtic languages have low diversity, suggesting a more recent expansion. In 2,000 years you'd expect a lot more changes separating them. In fact, it is possible that at that time not even Celtic and Italic had fully split from each other (regardless of whether one sees Italo-Celtic as a genealogical or areal group). AFAIK, Proto-Celtic is usually associated with the transition from Urnfield to Hallstatt, in which case c. 1300/1200 BC would be the oldest "mainstream" date. I'm not sure if you're trolling, or you simply have been failing to take your Ritalin this week, but I clearly said "Today, maximum hg I diversity is in NW Europe, whilst R1b in southern Europe" & that the pattern of R1b in Southern Europe is "complex"
So I'm really not sure how you interpreted this as "You stated R1b being most frequent in Southern Europe is why you think it originated there"
Give Krefter a break. So he's not as superior as you, and he makes a lot of spelling and grammatical mistakes and typos, and he doesn't read as closely as he should, and feels like he knows more than he actually does... so what? I believe that he is trying, and he has made some real progress in actually understanding the history and modern methodology in the last year or so. By the time he is 18 years old, he might know more than you do. Rob is saying that the diversity if R1b is greater in southern Europe than it is in the north. The frequency is of course highest in the north-west. Everyone here is well aware of this. "BB would be a very early form of western PIE at best, and then, probably it's eastern territory only"
This is a misleading statement. For example, it is extremely unlikely that Bell Beakers of western Europe, at this time, were in any way linguistically interacting with the Indo-European speakers who gave rise to most of the other major known branches of the language family. To say that they spoke anything close to PIE is crazy. It is more likely that they did speak proto-Celtic, and many of these people interacted with proto-Italic speakers along the overlapping border regions. Later, within the Celtic zone, there were additional waves of migration or conquest that caused major language bottlenecks and lowered the diversity of spoken languages such that the entire branch appears to be much younger than it is. Run through the comment flows again. Krefter seems wanting to engage in a tete-a-tete picking up perceived errors in my comments. Fine - I enjoy a debate. But when one makes straw man arguments and finds faults where there is none (indeed, largely resting on his own misunderstanding), and attempts to equate wise cautions as conspiratorial, "non-mainstream' ideas, then a limit is reached. 'This is a misleading statement. For example, it is extremely unlikely that Bell Beakers of western Europe, at this time, were in any way linguistically interacting with the Indo-European speakers who gave rise to most of the other major known branches of the language family. It is more likely that they did speak proto-Celtic, and many of these people interacted with proto-Italic speakers along the overlapping border regions. Later, within the Celtic zone, there were additional waves of migration or conquest that caused major language bottlenecks and lowered the diversity of spoken languages such that the entire branch appears to be much younger than it is." Well I agree with the second part. But I find BB, and 2800 BC, way to early for Celtic, even pre-Celtic. The reconstructed proto-Celtic is a LBA/ Iron Age language, even considering earlier bottlenecks. I suspect that western (iberian, southern France, Italian) BB wasn't even steppe admixed, and had no R1b. So how would you justify it being even PIE, let alone Celtic ? My take is that BB "Eastern' spoke a form of western, late PIE, from which Celtic & Italic would develop a thousand years later. I also think many early PIE branches "died off", such as those which were later overlain by FU in Northern Europe. "I suspect that western (iberian, southern France, Italian) BB wasn't even steppe admixed, and had no R1b." I strongly disagree here. While there may be no evidence either way, then how is it that some of the earliest Beaker people we do have genetic evidence for are extremely steppe admixed, and carry R1b and lactose tolerance genes? The exact same markers that are the highest in modern Celtic speaking regions? How are the earliest Bronze Age genomes from Ireland so similar to the modern Celtic speaking inhabitants? There couldn't have been a major genetic turnover among Celtic speakers in Ireland since they first arrived. "I strongly disagree here. While there may be no evidence either way, then how is it that some of the earliest Beaker people we do have genetic evidence for are extremely steppe admixed, and carry R1b and lactose tolerance genes? The exact same markers that are the highest in modern Celtic speaking regions? " BB is a sort of fusion. Early Iberian beaker (3000 - 27000 BC) looks different (Mediterranean skulls, collective burials) to that in central Europe. So if Iberian & central-southern French BB comes back steppe admixed, then you would be right. But all the Iberian & north Italian samples which range to 2000 BC (albeit non-Beaker contexts) are not. * "How are the earliest Bronze Age genomes from Ireland so similar to the modern Celtic speaking inhabitants? There couldn't have been a major genetic turnover among Celtic speakers in Ireland since they first arrived"
I agree. But it doesn't neutralize the possibility, nay probability, that the earliest IE evolved, morphed, or was wholly & repeatedly replaced by later IE forms, including into Celtic in the Iron Age. Remember that Pictish was replaced by Gaels almost wholly under our very noses with but a little dynastic turmoil. I find it more likely that Pre-Celtic was (eventual)Beaker related by 3000BCE. Fits with P312. Diversification of Celtic started at the BA Collapse. "I find it more likely that Pre-Celtic was (eventual) Beaker related by 3000BCE. Fits with P312." Moreover, I await ur reply as to how you are going to modify your hypothesis if early IBB genomes from Spain don't show steppe admixture ?? I have not been self-contradictory. You are making up definitions for linguistic terms that are nonsensical. A reconstructed proto language is, by definition, the last node before diversification into daughter language groups. I am saying that the Bell Beakers were likely speakers of proto-Celtic, or at least already along the branch that would lead to proto-Celtic, and therefore they were not still sharing a proto language which would later diversify into any of the other major branches of Indo-European outside of Celtic. I believe that Chad was saying the same thing when he referred to 'pre-Celtic'. It might not be the last common proto-language that led to the known Celtic languages (which would be proto-Celtic', but it was already along a branch that would later end up there, and nowhere else. "Moreover, I await ur reply as to how you are going to modify your hypothesis if early IBB genomes from Spain don't show steppe admixture ??" I won't really have to modify anything. I think it is likely that the R1b, steppe ancestry, lactose tolerance, and pre-Celtic languages all came to western Europe together. Maybe they did pick up some aspects of the Beaker cultural package from local Iberians. That is entirely possible. However, that package then exploded in Western Europe along with the the steppe genetics and language, not with Neolithic Iberian genetics and language (with the possible mini-explosion that led to the Basque related people). "I have not been self-contradictory. You are making up definitions for linguistic terms that are nonsensical. A reconstructed proto language is, by definition, the last node before diversification into daughter language groups. * "I believe that Chad was saying the same thing when he referred to 'pre-Celtic'. It might not be the last common proto-language that led to the known Celtic languages (which would be proto-Celtic', but it was already along a branch that would later end up there, and nowhere else." Because, for a start, no sane linguist has ever seen Celtic as a Copper Age idiom. Secondly, Celtic wasn't the only western IE lect which emerged from BB. There was Italic, not to mention Lusitanian and Ligurian, which aren't "Celtic". The latter is "para-Celtic" at best, the former not in the slightest. Now, many linguists doubt that Italo-Celtic is distinct branch. Moreover: Lusitanian, Ligurian, Italic do not form a clade, let alone come from proto-Celtic. Which means that my idea that BB should be seen as "late, western PIE dialects" - probably best preserved in Ligurian- correct, and your proto-Celtic idea a load of hogwosh. Proto-Celtic was but one group which emerged from some western IE lect around France, then expanded at expense of cousins, much later than the BB Era. BTW: "western, late PIE" isn't a made up term. Its a very apt term, which makes considerable sense to anyone who has a clue. * "I won't really have to modify anything. I think it is likely that the R1b, steppe ancestry, lactose tolerance, and pre-Celtic languages all came to western Europe together. Maybe they did pick up some aspects of the Beaker cultural package from local Iberians. That is entirely possible. However, that package then exploded in Western Europe along with the the steppe genetics and language, not with Neolithic Iberian genetics and language (with the possible mini-explosion that led to the Basque related people)." Maritime BB expanded from Iberia, not the steppe. Early Iberian BB won;t have steppe admixture. And it won't be IE. Do you even know anything about BB archaeology ? Can you list the different BB regional groupings ? Or do you just talk hot air ? I can only assume that you are playing dumb. "Which means that my idea that BB at best still a late form of PIE dialect"
Do you know what the letter 'P' in PIE stands for? The definition of a proto-language is the latest common ancestor of a language family, immediately before the start of the divergence into dialects. So, as I was saying, your idea of a late PIE dialect is nonsensical. If if had already diverged from even a single other IE branch, then there is no was you can call it PIE anything. And whatever the Bell Beaker people spoke in Western Europe, it had definitely diverged significantly from other IE language groups by that time. "Because, for a start, no sane linguist has ever seen Celtic as a Copper Age idiom." Of course. But the language group that is the ancestor of modern Celtic languages sure didn't diversify from PIE in the late Bronze Age. It actually does appear to be an early branch, and whatever you want to call the language that led up to proto-Celtic, it ended up in Ireland today, and the speakers seem to have strong direct genetic links to the first Bell Beaker people who arrived there and replaced the Neolithic population. Iberia is clearly complicated. That's why sometumes you can gain insight from looking to more isolated groups with a bit clearer history and work backwards. You are jumping right into a very complicated region, both linguistically and genetically, and making strangely simplistic statements with zero evidence. Meanwhile, offshoots from there have both data and a somewhat simpler history. Yet you dismiss that as irrelevant. "Maritime BB expanded from Iberia, not the steppe. Early Iberian BB won't have steppe admixture. And it won't be IE. Do you even know anything about BB archaeology ?" Your statements are so confused. Are you claiming that BB is a purely cultural phenomena? Because last I checked, all of the BB genetic evidence so far says that they had very high steppe ancestry, and their descendants with the highest amounts of the most similar ancestry now speak IE languages, and have for quite a long time. You are the one with zero evidence for your argument, that early BB people had no steppe ancestry and didn't speak IE languages. There is a term for people who think they are experts and can't see that they are deluded... the name escapes me right now, but I read about it somewhere recently. Maybe Krefter knows what I am talking about. Oh yes. That is exactly the one. It is not at all surprising that you should know so much about it. In reality, I think that we actually agree to some extent. I am open to many scenerios in 3000 BC Iberia. There is at least one (possibly contaminated) ancient DNA study that showed lactose tolerance alleles in Neolithic Iberia. Clearly the later BB culture was one of travelers who had lots of steppe ancestry and spread their genes in a very male biased fashion. This could easily have been an offshoot from a steppe group who migrated to Iberia, and then absorbed the local culture, but then spread that culture to the rest of north-western Europe along with their own genes. In this case, I think we should distinguish between the early Iberian-only BB culture, and the later migratory expansive BB culture/genetic signature which obviously was dominated by male-line steppe ancestry. All's I stated was that we don;t really know what early phase Iberian BB looks like as we have no aDNA from it yet, do we ? If it shows steppe admixture, then that's that. If not, then it means that the Iberian type Beaker people met eastern ones near Germany somewhere, fused, and expanded further. - 67 samples from Portugal, England, France, Czech Republic, Hungary, Germany and Spain. - The DNA testing covers all aspects. It would seem quite a coincidence that Celtic languages in Iberia appear only in the areas where Celtic culture is also attested. Which means that Celtic languages probably penetrated Iberia with the Celtic culture. There doesn't appear to be a genetic difference between the Celtic and the non-Celtic Iberians. This probably means that Celtic culture and language didn't have a measurable genetic impact in Iberia. As it's been stated, there doesn't seem to be a Celtic genetic impact in the British Islands either. Which probably means the same thing: the Celtic culture and language penetrated without a significant genetic impact. We have no idea what people spoke in the British Islands before the arrival of the Celtic culture (most likely bringing the Celtic language with it). We have no evidence at all that it was pre-proto-Celtic (whatever that is). Is it known when the paper about Bell Beakers will be published? "As it's been stated, there doesn't seem to be a Celtic genetic impact in the British Islands either. Which probably means the same thing: the Celtic culture and language penetrated without a significant genetic impact." I honestly don't care which way it happened, but this is a funny statement. There is actually no evidence that there was anything before Celtic in the British Islands. To say that the existing languages are all closely related does not mean that the sweeping replacement occurred from an outside population. It is much more likely to have come from a singular local population that became dominant. The ancient Celtic languages are too undefined to make strong statements about relationships. I should clarify here, so I'm not taken out of context. When I say pre-Celtic, I also mean pre-everything. Divergence between groups is clear by 2400BCE, and very clear before 2000BCE. This 2400 date is probably more for Celtic, with the Rhine/British group, with clear Bronze working distinctions made before 2200BCE, when specific British styles appear. These trade links are fairly static in the BA, with some groups in Southern Europe looking pretty isolated. "I should clarify here, so I'm not taken out of context. When I say pre-Celtic, I also mean pre-everything. Divergence between groups is clear by 2400BCE, and very clear before 2000BCE. This 2400 date is probably more for Celtic, with the Rhine/British group, with clear Bronze working distinctions made before 2200BCE, when specific British styles appear. These trade links are fairly static in the BA, with some groups in Southern Europe looking pretty isolated." Exactly. The PIE days were long gone by this point. I am really looking forward to these Bell Beaker genomes, because this is actually very hard to make sense of from archaeology alone. Of course, new genomes might not tell us very much about language spread in this case, but it will be interesting to see the patterns. That news appeared briefly on the site of that local government, from where some samples were taken. It seems that they got this early information from the researchers and went on with the press release, but after were told to take it down because it was not meant to be published. It probably means that the study is quite advanced, but not ready for publishing just yet. No idea when it will be published. Its chronology and interpretation are discussed today. The witnesses are located in the older horse of Portugal Chalcolithic and Bronze Age between 2500 and 1800 BC. Reach extended across much of Europe (France, Germany, Italy, Hungary, Czech Republic ...). Characteristic of this culture is the glass bell, made ​​of ceramic with a shape reminiscent of an inverted bell engraved and decorated with geometric details. These vessels have appeared mostly in funerary contexts were also found in the domestic setting. Usually their appearance is related to the diffusion of the metallurgy of copper through Western Europe. But the sample coverage is magnificent , can't wait. Yes, I understood what you meant, but I just think there is no need for pre-Celtic to have spread with Bell Beakers. The spread of Celtic languages is already parsimoniously explained by the spread of Celtic culture. Linking some form of pre-Celtic to Bell Beakers actually seems to bring more problems than benefits when you look at the overall data available. "There is actually no evidence that there was anything before Celtic in the British Islands." I don't know what happened either, but for funny statements you have to admit that this one takes the cake. I'm pretty sure Celtic starting to form around 2400-2500 BCE on the Rhine. The genetics of Britain were set from 2400BCE until 400AD. Cultural diffusion to Britain makes no sense when they hold a lot of trade monopolies and are the religious center of the Celtic world until the Roman invasion. So what are you suggesting, that the Celtic culture and language spread from Hallstatt (originally) to Iberia but to Britain it was only the culture but not the language that spread? And coincidentally in Britain they already spoke Celtic? Not impossible, of course, but why would it happen that way? And why would they speak Celtic in Britain in the first place but not in Iberia, or in Italy? Who are you addressing, Alberto? I was addressing you, Chad. You didn't quite elaborate on what you were suggesting as a model of spread of Celtic, or at least I didn't understand what you were trying to say. Some here seem to have suggested that 1) Pre-"Celtic" emerged in Iberia, expanded all the way to Northern and Central Europe, then 2) a distinct branch (Proto-Celtic itself) emerged during Hallstatt (or even before it) and re-colonized the entire "Celtosphere" - ALL OVER AGAIN, just to explain the low diversity observed when the daughter languages are first recorded. That is not very parsimonious, IMO. Step 1) is entirely dispensable to explain Celtic itself. Now, if what step 1) actually describes is that some early offshoot(s) of PIE for some reason ended up in Iberia and then moved back east during the height of BB giving rise to Italic, Celtic, etc., that's another thing. Still looks unparsimonious at first blush, but it may be justified archeologically and/or genetically. Linguistic evidence itself would be hard to find in this case, not least because it is certain that several non-Celtic, non-Italic poorly attested or unattested western PIE languages went extinct early on. As for the >2.000 BC "Out of Rhineland" suggestion, it faces the same problem identified above: it fails to explain the lack of diversity within Celtic. British Celtic is closely related to the mainland languages. Any very early date, again, would have to assume a plethora of back and forth waves of migration/contact, each one completely replacing the other linguistically. Once more, unparsimonious and unlikely. At this point, I think there is no strong evidence for BB being IE-speaking or not, either entirely or partially, though there is strong evidence that it has nothing to do with Celtic specifically. Thanks, that basically explains the problem and it shows the only possible and parsimonious solution to it. I meant that Celtic is divided more along the lines of Insular and Continental. The whole P/Q stuff is in the minority now. Sure, there is some gene-flow from Gaul and Belgica into Britain from about 300BCE - 25BCE, but this is restricted to southern Britain and likely more of an elite movement rather than a whole population. I don't care about Hallstatt or LaTene. They're more important to Gauls, Galatians, etc., with minor influence on Celtiberians. Influence of Hallstatt and LaTene is so minimal in Britain it could all be related to trade. We see from BA Ireland that the people we need, the steppe-derived L21 were already in place. Did Ireland and Northern Britain just magically change languages without gene-flow? Why would they? There's no incentive. Hallstatt and LaTene derived groups are more disjointed than late Bell Beaker. Easily. Britain is the great tin exporter and religious center of Western Europe for quite some time. I think the formation of Celtic easily stretches back to 2500-2400BCE along the Rhine, definitely no later than 2000BCE with all of the connection and migration between Britain to clear down by the Alps. The genetics of Ireland and Northern Britain were pretty much set by 2000BCE. Nothing else really happens until a few Gauls and Belgae show up. Arguing that Celtic is only split by a couple or a few hundred years makes no sense. For comparison, look at Nakota, Dakota, and Lakota. They have been split for 4-500 years. Or, even Arikara and Pawnee. They're much more mutually intelligible than say Insular Celtic and Gaulish. You can go back 1000 years in the Siouan family, half a continent, and see much more of a relationship than between Celtic languages. I'll bet Hallstatt and LaTene are mostly U152. Do we have any examples where language changes and there's little gene-flow. -Ancient DNA confirms modern English have ancestry from oroto-English speakers. -There's lots of very recent shared ancestry amount all Slavic speakers. -There's North Asian ancestry in Turkey. -Essentially all white Americans have a big chunk of British ancestry and many re mostly British. African Americans are on avg. 20% British. -Latin America has more Spanish ancestry than Native or African. The only example where there may have been little gene flow is spread if Turkish languages to Turkey and Latin in Western Europe. I think it is very possible though Rome changed genes a lot. We have too little arrestment to Celtic and Italic languages to say how diverse those families are. If not tell me. AFAIK we only have nouns from foreigners and a handful of documents written by native speakers. I was not talking about the P/Q distinction, really. Attested early Celtic languages in the British Isles in general, while they may form a subgroup due to certain crucial isoglosses, are not that different from those of the mainland, at least when one considers the internal diversity of other IE branches, even within Italic. Whether the populations themselves might have come from the Rhine area, it would be anachronistic to call those early pops "Celts", since language replacement by the much later Celtic proper would still be required to realistically explain what is known from the linguistic situation there. And at least in Iberia, Celtiberians have always been associated with Hallstatt and a late (˜700-600 BC) entry, AFAIK. The few more archaic-looking features of Iberian Celtic languages can be easily explained by their having been cut off from changes in core Celtic areas by subsequent expansions of Aquitanians and Iberians along the Pyrenees. "They're much more mutually intelligible (...)"
No. That is a common mistake, but mutually intelligibility per se has nothing to do with linguistic genealogy. There are just too many factors such as trade links, geographical proximity, the presence or absence of sub- and super-strata, the existence of prestige dialects, taboo lexical replacement, and so on, that can ultimately influence mutual intelligibility, so it is irrelevant as far as genealogy is concerned, particularly in the long term. Generally, what really counts is the accumulation of shared sound changes, shared morphological irregularities and shared replacements in the basic lexicon. Most mainstream linguists nowadays would agree that there are no hard and fast rules as to how quickly languages change, so each language group has to be seen on their own terms when it comes to absolute dates. Of course, relative dates (which can be useful for internal classification) are much easier to come by. Having said that, everybody also agrees that some things are more likely than others. Your scenario would require exceedingly slow change in Celtic languages for thousands of years, then a steep acceleration of changes (compared to the previous situation) leading up to modern languages, somewhat suspiciously just after Celtic languages start being attested. Completely off topic, so probably off limits. But would you care to do this, in order to see if Ahrensburg is ancestral to EHG? Thousands of years? I'm only putting it close to 1000 years before Early Hallstatt. Did you think that maybe Celtic wasn't attested for before that because no one was writing in the area at that time? Can you show me an example of say a Native American language family as divergent as the Celtic languages in that short of a period? It's a bit of a stretch to suggest that an island of 2 million people just swap languages without a recognizable gene flow after they've likely shared a related tongue for over 1500 years. I don't understand how, if Celtic arrived just at 275BCE with a few La Tene things, where are the pre-Celtic place names? Or even Northern Gaul? Not even the Saxons had that much luck replacing 20-40% of the gene pool in England. That scenario makes no sense. Fully British Style bronze is attested at 2200 BCE. "Fully British Style bronze is attested at 2200 BCE." Lol . What's that got to do with it ? Anyhow, the thine was in fact was the centre of the Nordwestblock". And in fact the BA only begins at 2200 BC in Central Europe and as late as 1700 BC further west ?? time, there was no such thing as Celtic or Italic or Greek. the Indo—European dialects of western and southern Europe formed a continuum. " "That is not very parsimonious"
I take your point but just a thought on that aspect. then it might be more parsimonious than it looks. For example if Iberia-Britain got an early advantage through good local supplies of copper and tin for Bronze then maybe that advantage shifted to central Europe / Bohemia later because of abundant iron? So maybe a bronze based expansion from the west first followed by an iron based back flow? "Do we have any examples where language changes and there's little gene-flow. The only example where there may have been little gene flow is spread if Turkish languages to Turkey and Latin in Western Europe. I think it is very possible though Rome changed genes a lot." Logically it seems to me language change with little gene flow would often involve a dramatic military advantage on the part of the language changers. Does anyone see a big genetic impact of Hallstatt people in large parts of Iberia? We don't see, even in the Y chromosome, any difference between Celtic and non-Celtic speakers in Iberia. Coincidentally, the areas where Celtic was spoken are the areas where Celtic culture appears. Same as in Italy. This makes a strong case for Celtic languages arriving to North Italy and good part of Iberia with the Celtic culture. And yes, without any genetic impact. That's probably because in the Iron Age is when elite dominance was possible, unlike in the Late Neolithic when it was technically not possible. It's not by chance that Celtic was replaced shortly after by Latin in many of the areas. And again without any detectable gene flow. Besides, it's impossible for pre-Celtic to have arrived with Bell Beakers to different areas of Western Europe. If pre-Celtic arrived to Britain, to Iberia, to France, to Central Europe... how could all of them with time turn into proto-Celtic? And after into Celtic? This is like Y-DNA, the same mutations can't happen in different places at the same time. Once they diverge they only keep diverging, unless they are replaced. So for the Bell Beaker scenario you'd really need proto-Celtic proper at around 3000-2800 BC. I don't have a strong opinion about this personally, but I don't think that linguists would agree with it. Garrett is just one of many with their own ideas. From a simple "dialect" to Mycenean in a couple hundred years? To each his own I guess. Garrett is just one of many with their own ideas. From a simple "dialect" to Mycenean in a couple hundred years? To each his own I guess. " Yes. He argues Mycenean still bears all the hallmarks of essentially reconstructed PIE, being minimally Greek morpho-syntactically. Of course, his collateral ideas about Celtic & the non-existence of an "Italo-Celtic' node is not lone, either, but probably the dominant view since the 1960s. Only a couple of scholars think contrary. But, as we know, linguistics is hard to prove with absolute dates. All we have to do is keep in mind the ongoing trans-continental contacts and the linguistic mobility & fluidity of preliterate communities, and it'll keep everything in reasonable perspective. As Alberto rightly pointed out, the Iron Age becomes a different era, when Chiefdoms became more prevalent & stable, which would have imparted more stable boundaries and linguistic transmission. If a bunch of Bell Beaker descendants from the continent sailed to Britain and the native lot of Bell Beaker descendants shifted to their language - even if there was a substantial genetic impact, how would you be able to tell? It's not like they're coming from Mongolia to Anatolia. "If a bunch of Bell Beaker descendants from the continent sailed to Britain and the native lot of Bell Beaker descendants shifted to their language - even if there was a substantial genetic impact, how would you be able to tell? It's not like they're coming from Mongolia to Anatolia." If we assume continental Celts in the Iron age were like modern French or Germans, then they had very differnt Y DNA from Bronze age British/Irish and Iberians. We would be able to detect them with Y DNA. Only about 2% have U152 and 1% have Df27 in Ireland. The same is true for England. U152 is at 3-5% in Spain. 15-20% have U152 and 20-30% have DF27 in all of France. Then in Western parts of Germany 15-20% have U152 and 20-30% have U106. So, we're not seeing evidence of significant paternal migration from France/Germany into the British Isles and Spain in the last 2,000 years. I'm hesitant about believing any theories about the age of Celtic languages since they are all essentially extinct. Lets say the first time people wrote about Eastern Europe was in 1200 AD. Just about everyone would have been speaking Slavic language, just like everyone spoke a Celtic language in Western Europe in 0 AD. The situation for Eastern Europe is still differnt, because we can see in DNA all Slavic speakers have recent shared ancestry but we don't see recent shared ancestry between (former)Celtic speakers today. Maybe more detailed analysis will. I'm surprised no DNA study has looked for genetic signals for the expansion of Celtic languages. I look at it as the first known languages in Western Europe were recorded 2,500 years ago and most were Celtic. I don't see why Celtic languages couldn't have expanded with Bell Beaker. It makes sense. We do know little changed genetically in Britain between 2000 BC and 0 AD and change in language usually involves change in genes. If a change in language usually results in a change in genes, then modern French and Germans can't be a good reference for Continental Celts 3000 years ago. "If a change in language usually results in a change in genes, then modern French and Germans can't be a good reference for Continental Celts 3000 years ago." 2500-2000 years ago, we have no written records in Western Europe from 3,000 years ago. I get what you're saying but it's differnt for France, because Romans didn't make Gaul their home they made it their territory. The Spanish made America their home, Germans made Britain their home, Slavs made most of Eastern Europe their home, that's why there was genetic change. I wouldn't be surprised if there's Italian ancestry in former Rome or a trade of genes, but I don't think it was very significant. For West Germans there is a difference between them in Y DNA with France. They have more U106 and I1, because Germanic-speakers made that land their home. It'd be hard to believe France had something like 80% L21 before the Roman empire. If Iron age Continental celts didn't have 60-80% L21 or 60-80% Df27, then Iron age Continental Celts didn't make a big Y DNA impact on the British isles or Spain. Period. Too bad we don't have suitable aDNA from France. I wonder if anyone's ever tested trying to block a steel sword with a bronze one. The bronze sword would get a significantly deeper dent on its edge, that's about it. (Contribution of DNA and data on mitochondrial branches). The sanctuary at Ribemont sur Ancre (Somme) provides exceptional corpus of human bones. On this site considerable deposits of human bones were, somehow, fossilized by Roman embankments. Two sets are particularly noteworthy. One, called "mass grave", is presumably that the remains of the bodies of the same battalion of warriors directly from a battlefield. The second, "ossuary in 1982," is a rim type of construction of wells whose materials are human limbs folded and used as a frame for walls probably related with clay. The remains of the "grave" indeed pose many questions these young warriors-they belonged to the same community? This she was very homogeneous and welded, as was, at the same time, the Hellenistic phalanxes? The remains of the "boneyard" discovered a few meters from the first deposit, they have the same characters: are we dealing with the same population? Does exist they kinship within this second group? Do they exist from one group to another? The answer to these questions will obviously fundamental data for understanding the phenomenon of war in Gaul in the third century BC. BC, which we know was at the highest point for structuring society. But this early research are only an introduction to a larger company both multidisciplinary and inter-laboratory; they will be the first cases of the formation of a broad database that should concern all the Iron Age. More specific studies but focused on limited corpus of bones will be undertaken under strict and binding protocols excavations under the control of palaeogeneticists (all burials, human bones from the same structure, human bones on the shrines and habitats). Gradually, these genetic comparisons will give the opportunity to refine the definition of markers of different populations based on data which our laboratory has, we want to actively participate in these issues in the coming years. Thanks! Iron Age, but mtDNA. Has the study been published, do you know?
" look at it as the first known languages in Western Europe were recorded 2,500 years ago and most were Celtic. I don't see why Celtic languages couldn't have expanded with Bell Beaker. It makes sense. We do know little changed genetically in Britain between 2000 BC and 0 AD and change in language usually involves change in genes." Brittonic Celtic is basically Gallic. It looks like it literally moved from Gaul to eastern Britain a couple of hundred years prior to its first attestation, so 2000 BC is out of the question. Next, even more distant Celtic languages like Goidellic, and the rest combines, still look like they 'formed' sometime in the late Bronze Age, so 1000 years after Beaker, give or take. What this means is that BB could only have been ancestral to all these 'western IE' collectively, and not solely Celtic, nor proto-Celtic, nor any language down the 'dedicated path to Celtic'. R1b -> P312 explains the expansion of Celtic (or proto-Celtic) culture quite well, obviously along with DNA. Bell Beaker so far looks likely to be P312 based on the very limited testing done so far, hence a BB Celtic correlation. The sub-branches of P312 explains the sub-branches of Celtic cultures quite well and P312's likely mostly non-Celtic sibling U106 maps well to the Anglo-Saxons moving into Britain. I see no reason to not think P312 represents the pre BB and pre Celtic source population that expanded as BB and then the Celts (probably not exclusive to them of course but such populations being predominantly of that Y DNA) throughout where we see Celtic cultures arise as well as the modern distribution of P312 DNA (as well as our limited array of ancient DNA). I’am very curious about the research concerning the Bell Beaker heartland Portugal and Spain in relation to migration and blending with other (North-) West Europeans! My features are exact these but in a more exaggerated form. When I look at my autosomal DNA I see that for ten generations (1024 persons) my ancestors came from the Northeastern part of the Netherlands and Northwestern Germany. When I go 15 generations (more than 16000 persons) back I see besides a Mediterranean influence (due to the Spanish Army...) this still is the case, so that makes it for over 90% Northwest European. And most of all these regions correspondence with the settlements of the Beaker folk in the Netherlands and Germany. The Bell Beaker folk are often associated with haplotype R1b, in my region over 60% of the men have this haploptype. The Bell Beaker must have had significant influence on the genepool in the region of my ancestors. So am I jumping to conclusions when I state that my features are in some way related to the Beaker folk? Can the 'phenotype echo' of the Beaker folk be so clear in modern day Europe?